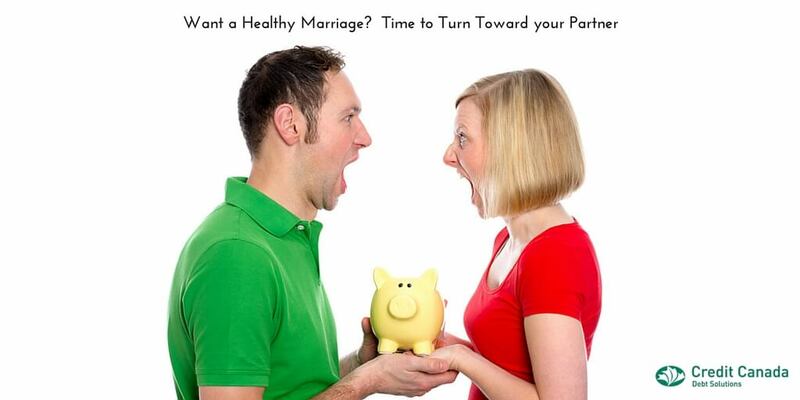 Want a Healthy Marriage? Time to Turn Toward your Partner. Psst….Hey buddy. Can I sell you a cheap divorce? According to Ontario’s Ministry of Attorney General, court costs for divorce are a measly $447. But wait a minute. If you look closer at the statistics you may want to make that marriage work. Statistics Canada reports that 35-42% of Canadian marriages end in divorce. And while some of those are amicable, the legal costs of a contested divorce can range from $7,000 to $75,000. Add to that the costs of child support, spousal support, setting up separate living space, etc. and you are looking at hundreds of thousands of dollars. Non-profit credit counselling agencies can help you if you are in debt because of divorce. But why not keep your marriage healthy and use your hard earned money to build a better life for you and your partner. Don’t worry…Credit Counselling Agencies are here to help struggling divorce lawyers when their business dries up. Don’t wait until it is too late to save a failing marriage. Avoid the divorce trap by starting early and working at the relationship. Dr. John Gottman, author of ‘The Marriage Clinic,’ recommends that couples “turn toward versus turn away” from each other. In other words, you need to pay attention, invest time and energy in your partner if debt problems are hurting your relationship. Join a league such as mixed volleyball, dodge ball, bowling or euchre for a regular, fun night out. Then go out for coffee and point out the highlights of your partner’s game. Have a date at the mall with supper at the food court and then split apart to buy gifts for each other keeping under $30.00 per person including the meal. Go to a local festival or parade. Large cities and small towns often have seasonal festivals, markets, fairs or free concerts. Check your online local newspaper for details. Don’t forget to hold hands! If you are a fan of the series, Happy Days, you may remember “Inspiration Point” where local teens went to “park.” Why not pretend you are teens and spend a romantic evening at your local "Inspiration Point." Visit your local library for books, videos and magazines. Local library even loans fishing poles for families! Try spending an evening together browsing. Spend an evening over a hot beverage and your favourite dessert and talk about your past week in one of those high end coffee shops in book stores or in scenic parts of the city. Try searching for an online recipe that you both love and spend an evening cooking up something new. The more complicated and messy the better. Remember, it’s not the final dish that counts…it’s the fun you have in the kitchen. Why not use your credit card points to do something special together like an overnight in the capital city or a free movie? Remember, it’s not the activity that counts…it’s the simple act of turning toward your partner. And no marriage can thrive without that.